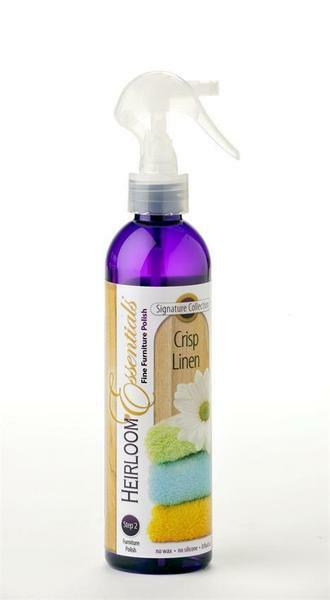 Our Heirloom Essentials Crisp Linen Furniture Polish has a fresh and plean scent. Who doensn't love the smell of clean clothes! This furniture polish is silicone and wax free which is the perfect choice for protecting your heirloom quality hardwood furniture! The finest oils are used in this polish to moisturize and preserve the wood of your furniture and cabinetry. Woodwright® Stain & Finishes is an American made company that has been producing stains, varnishes and furniture polish for year! It's a name you can trust! Some past customers have used this polish for many additional applications such as leather furniture, stainless steel appliances, vinyl surfaces, to remove adhesives from many surfaces and to even detail and clean cars! Please do not apply this polish to cloth. It is also wise to test a small spot to be sure that the polish works well with the materials you are trying to clean. We offer our furniture polishes in a wide variety of scents such as cherry blossom, cinnamon apple, green apple, grapefruit, lemon zest, clementine and black cherry! We also have fun season scents such as spiced pumpkin, cranberries, Christmas tree and candy cane. If you want your kids to help with the polishing then select our children's fragrance featuring the fun essence of bubble gum!